Life is a journey not a destination, and is best viewed from atop a good horse. Floyd Beard has been a cowboy most of his life. Along the way he’s had many other jobs to support his cow habit. Floyd and his wife Valerie currently run a cow calf operation in the canyons south of Kim, CO.
Floyd began writing poetry while out working his cattle in the 1980’s. He would write down lines and verses about what he experienced while out in the saddle and dealing with his livestock and horses. He would then mold these thoughts into stories and songs when he got back to the house that evening. His poetry is about his own experiences and his observations of the western way of life. Floyd’s stories are inter-woven with his western code of high ethics and integrity and sprinkled richly with humor. Floyd also recites some cowboy poetry classics, from some of the best cowboy poets from the past, keeping the western spirit and history alive. He has presented his stories and western songs all around Colorado and many other surrounding states, and as far away as Stoney Plains, Alberta Canada. Floyd served three years as the President of the Colorado Chapter of the Western Music Association. Floyd has also been honored to win several cowboy poetry awards which include silver buckles at the National Cowboy Poetry Rodeo. Floyd has also been honored to be named Western Music Association's Male Cowboy Poet of the Year for 2016 and 2017. His latest CD, Short Grass Country was nominated and became a Top Five Finalist for WMA Cowboy Poetry CD of the Year, and has been in the Top 10 Cowboy Poetry CD's played on the radio since its release in 2016. Welcome to my website. Glad you were able to traverse the canyons and thick brush of the world wide web. Take a breather and refresh yourself with some inspirational words of the old west. "Ain't a Hermit" (#6 on this CD) won the Academy of Western Writers 2017 Spur Award in the Best Western Poem category. The award was presented at their Annual Convention in Kansas City, MO, in June, 2017. In 2016 Floyd had the honor of opening the WMA 2016 Friday Night Opry with a patriotic tribute reciting The Ragged Old Flag by Johnny Cash followed by leading everyone in the first verse of God Bless America and the Pledge of Allegiance to the American Flag, Old Glory. 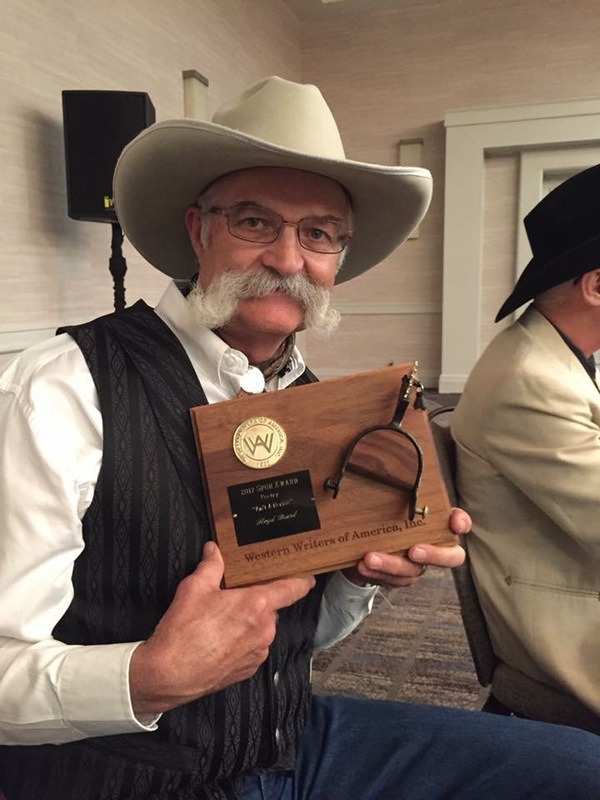 Floyd was presented with a custom wooden treasure box made by Dale Page, honoring his service as President of WMA-CO.
Floyd won first in the SilverBuckle division Reciter-Humorous and champion of the Shootout. Floyd has now won a total of seven Champion Belt Buckles from different Cowboy Poetry events, 4 from The National Cowboy Poetry Rodeo, 2 from the Kansas State Cowboy Poetry competition, and one from the Colorado State Fair Cowboy Poetry Shoot-Out. Floyd states "Though these are indeed an honor, the camaraderie and lasting friendships you make are the real prize. While you are putting it on the line with other great poets, honing and bettering yourself in your craft, you build great friendships with just downright nice folks. And, I have to say my first love by far is presenting cowboy poetry to groups of people, performing them in a way that makes the stories come alive in their minds. Yessir, that is the best!"